Dotaland notes: Chinese gaming channel Gamefy visits iG, Noah’s Ark, and LGD team houses.Video link below. iG has just moved to a new base in an apartment in Shanghai, where they have a dedicated internet line that is vastly improved over what they had in Shanghai. According to Zhou, Faith grinds his teeth in his sleep and likes to eat at night. ChuaN’s cell phone holder is a gift from a Thai friend. Zhou has a lucky Buddha that he brings with him. IG typically trains from 5pm to 9pm every day, and they go to bed around 1-2am. Noah’s Ark’s training base is their team owner and sponsor’s internet cafe, also in Shanghai. Their goal is top 3 in every competition once they get the hang of Dota2. They all like spicy food, so they often go to the restaurant next door for dinner, where their captain makes the order for everyone too. Last scene of the NA section is them getting taxis to a competition that night. SGamer (SG): Thank you to DK.BurNing for accepting our interview. DK just underwent roster changes, and went on to get a win over iG here at WCG China. Can you describe the process of this last match? BurNing: We haven’t practiced Dota much recently, plus we have new members and lack understanding, so we thought it’d be very difficult to win, we never thought we could beat iG here. SG: What were the considerations that led to Dai and 357 being recruited to DK? BurNing: This was something we had considered immediately after TI2. We had a lot of people to choose from, and the reason we ultimately went with Dai and 357 was because teamwork and closeness is important to our team atmosphere, and these two players contribute to that. SG: Playing both DotA and Dota2, are there any difficulties, and are there any differences for you all as professionals? BurNing: The two games do have some differences. For example the way bottles interact with runes, in DotA you have to specifically use the bottle, in Dota2 you simply right click the rune. Dota2’s hotkey system is different as well, you can directly alter and customize them. For example 357 uses the QWER system, and during practice once, 357’s Tidehunter wanted to eat a tree, but the hotkey was on V, and he ended up using his ult… very awkward. SG: This… what kind of situation was this? BurNing: 357 hasn’t played DotA in two years, his ladder score isn’t even 1500! SG: Does B god have any wishes for this WCG? BurNing: For every competition our wish is to win, and this one is no different! SG: At TI2, DK’s results weren’t great, do you have any plans and hopes for TI3? What are your plans for after TI3? BurNing: TI3 is definitely something where we will give our all for success. As for myself, no matter what results I achieve, I will be retiring. SG: You’ve been named one of the three best carries in the world, what do you think are the attributes that other carries can compare with you? BurNing: I like Zhou and Sylar the most, although Sylar still lacks some experience right now, and Zhou trains relatively less so isn’t in the greatest form. SG: Thank you to B god for the interview, we wish you all the best in your future competitions! Dotaland note: 820 sounds noncommittal, but reveals that there are talks going on between him and EHOME about returning in some capacity… this, his thoughts on TI2 and more, below. Sgamer (SG): Thank you to 820 for doing this interview with Sgamer. A while back you said in one of your videos that you might return to EHOME, approximately when was it that you got in touch with EHOME? 820: Someone mentioned it to me in passing, I said I’d consider it, but right now the whole thing is still missing some key elements. SG: Even the news of EHOME moving headquarters to Shanghai isn’t accurate? 820: Like I said, everything hasn’t come together yet. SG: Returning to EHOME is still in your consideration? SG: Not long ago, 357 and Dai both transferred to DK, so what kind of a situation is EHOME in right now? 820: Basically disbanded? Right now LanM is the only person left. SG: As for whether you will take up the managerial/coach position at EHOME, is this news accurate? 820: We’ll have to see what developments and negotiations occur, there won’t be anything in the short term. SG: What kind of feelings do you have for EHOME? 820: Of course I really love EHOME, after all they are the team that I went through much trials and tribulations with. All the details within are hard to describe now, so I will just wish EHOME luck! SG: What do you think were the reasons for EHOME’s weak performance at TI2? 820: Unclear positioning and roles within the team, and individual skill was slightly lacking compared to other teams. SG: There were once rumors saying that you would make a comeback to play in TI3, have you ever had these thoughts? 820: Where did these rumors come from. Yes, but they were just random thoughts. SG: Dota2’s professional scene is pretty much all the same old faces, have you found any new players with good potential? 820: It’s hard, unless current players are willing to train and help new players, there is basically no chance for them. Unless a completely new team appears and takes the scene by storm! SG: EHOME has pretty much fallen apart, how do you view the ACE Alliance versus EHOME situation now? 820: I feel that, the circle of people involved isn’t very large in the first place, so it would be best if we never had any divides such as this, no one has it easy. SG: Previously you created a Dota2 first person vod, but didn’t get many views. Will you give up on creating content for Dota2 in the future because of this? 820: No, I will continue, but just not as much. SG: Perhaps a lot of people do not necessarily view Dota2’s future positively, what are your views on this after your experience at TI2? 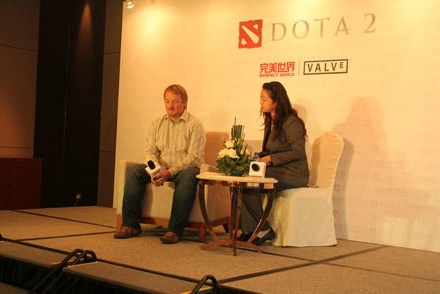 820: Dota2 is a game with very high production quality. But the only problem is that it’s too hard for new players to get in, and right now there is no open beta, so it’s not reaching the masses. TI2’s impression to me was that this game has really great spectator value. SG: To end the interview, any last words? 820: Thank you to SGamer for the interview, and I hope SG continues to get better.